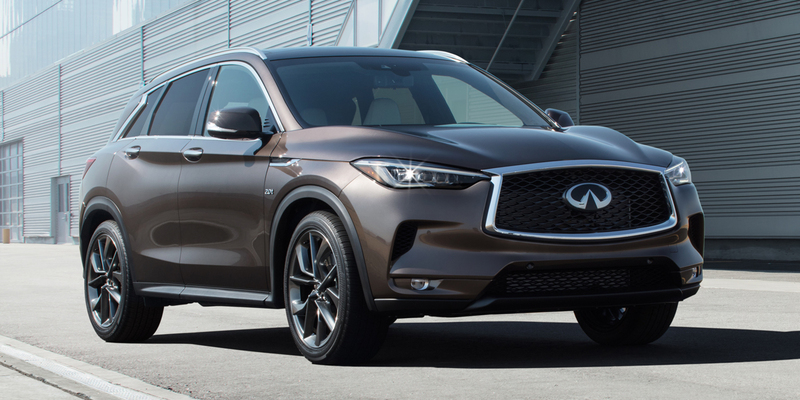 The QX50 hits all the premium compact SUV high points—it’s posh, stylish, quick, and fairly nimble, and it offers excellent room for people and cargo inside its sensibly sized exterior dimensions. Getting desirable optional equipment requires stepping up to the top-line Essential trim level. The QX50 is available with ProPilot Assist, a driving assistance technology that pairs full stop-and-go adaptive cruise control with automatic lane-centering steering assistance. 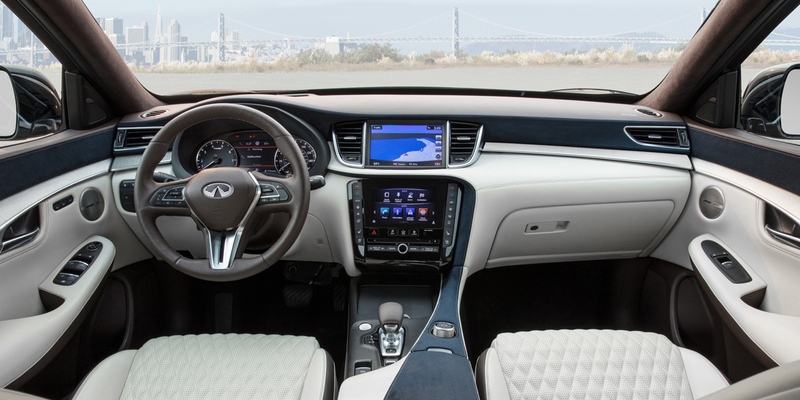 The QX50 is Infiniti’s entry into the popular premium compact SUV segment. 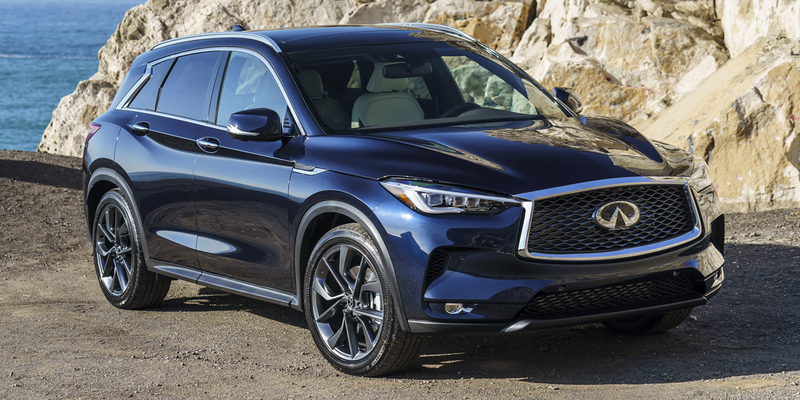 After taking the 2018 model year off, the QX50 is back for 2019 in completely redesigned, re-imagined form. The new model switches from rear-wheel-drive architecture to a front-wheel-drive-based chassis, and it’s about two inches shorter, 3 inches taller, and almost 4 inches wider than the previous generation. 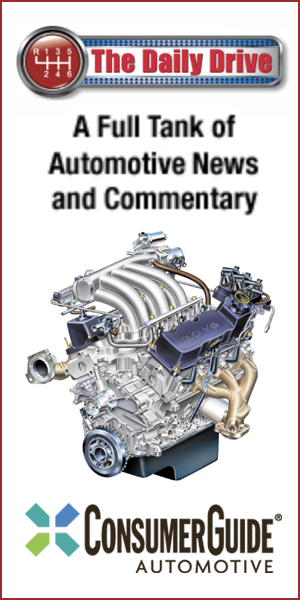 The sole powertrain is a new turbocharged, variable-compression-ratio 2.0-liter 4-cylinder that puts out 268 horsepower and is paired with a continuously variable transmission (CVT). The base Pure model comes standard with features such as forward collision warning with automatic emergency braking, keyless entry and starting, a dual-screen infotainment system, four USB ports, a hands-free power liftgate, and 19-inch wheels. The Luxe model adds a panoramic sunroof, auto-dimming rearview mirror, roof rails, and a blind-spot monitor. The top-line Essential gets leather seating, a navigation system, surround-view camera display, front and rear parking sensors, and three-zone climate control. The Essential can also be equipped with option packages that include 20-inch wheels, adaptive headlights, heated steering wheel, rear cross-traffic alert, lane departure warning and intervention, and upgraded adaptive cruise control. 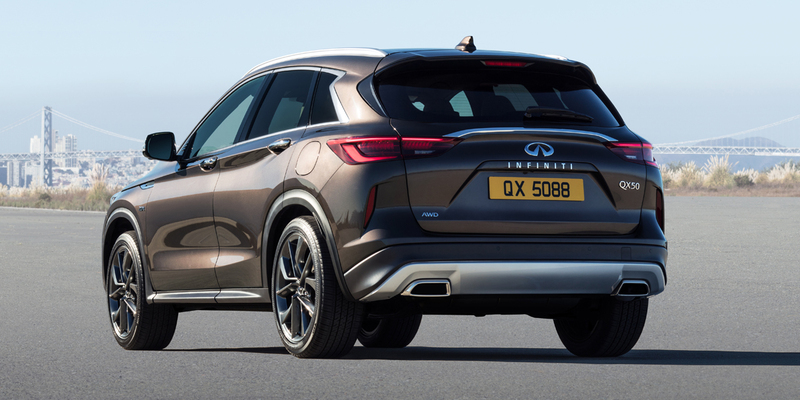 Essentially everything—the QX-50 is redesigned for 2019. EPA-estimated fuel economy is 24 mpg city/31 mpg highway with front-wheel drive and 24/30 with all-wheel drive. 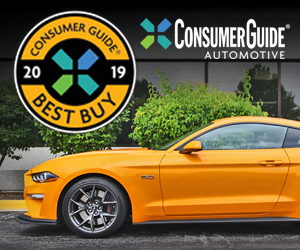 In Consumer Guide® testing, a front-wheel-drive Essential model averaged 25.5 mpg in 75-percent highway driving. The previous Infiniti QX50 was pretty good at the “sport” part of the SUV equation, but not so much on the “utility” part. The all-new QX50 delivers much-improved levels of both those traits. The new variable-compression-ratio engine is an impressive piece of high-tech hardware, but its fuel economy doesn’t really impress compared to class rivals. Still, the QX50’s compelling list of standard and available features, passenger and cargo utility, and high style inside and out make it an excellent choice. AVAILABLE ENGINES 268-HP, Turbocharged 2.0-Liter 4-Cyl.